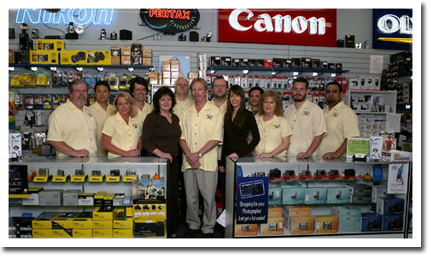 A family-owned camera store, serving amateur & professional photographers. Arlington Camera is a unique, family-owned camera store offering a wide range of products to meet the needs of both amateur and professional photographers. The equipment you need. The service you deserve. As a customer, you can expect not only the latest information and products offered in the camera industry, but also a high level of customer service from our friendly, knowledgeable staff and a commitment to quality in every product we sell. As a full service camera store, we strive to meet the varied needs of every customer. In response to our customer's interests, we stock a vast array of photographic products, from rare turn of the 20th century cameras and accessories to the latest hi-tech digital equipment. We also offer every imaginable type of equipment to assist you - lenses, memory cards, camera bags, photographic books, digital printers, professional lighting, backgrounds and so much more! Therefore, many of the items and services we have available at Arlington Camera are not featured on our website. We would really like to hear from you if there is a special product or service you are searching for. Stop by today for all your photography needs. Thank you for visiting our website today. If you're in the Dallas/Ft.Worth area, we'd like to invite you to stop by to let us assist you with all your photographic needs and offer you a bit of true Texas hospitality.